Las Vegas has certainly seen its share of stars over the years, but few as charming and instantly popular as the new baby dolphin recently born at The Mirage Hotel & Casino. The young calf, who has yet to be named, was born July 17 at Siegfried & Roy’s Secret Garden and Dolphin Habitat, a facility focused on humane conservation and education. “Everyone at The Mirage is thrilled about the new calf and how well she is doing,” said David Blasko, Director of Animal Care in a statement. This is the sixth dolphin born at the Las Vegas facility, which opened in 1990. Currently home to ten dolphins, the last calf was born in 2011. While Siegfried & Roy’s Secret Garden and Dolphin Habitat does not offer choreographed dolphin shows, it is focused on research, outreach and education. This includes educating the public about marine animals and conservation efforts. Guests are given the opportunity to observe the dolphins very closely in the zoo-like animal sanctuary, as well as participate in various close-encounter experiences, such as swimming and painting with the dolphins. The facility’s newest dolphin, who can be observed in the birthing and research pool, has attracted countless visitors who can’t seem to get enough of her. “We have people come in and spend hours sitting and watching her swim around,” said Wise. In addition to educating visitors about marine life, Siegfried & Roy’s Secret Garden and Dolphin Habitat covers topics such as the impact of plastic pollution, marine debris, and how our daily decisions impact the world’s oceans and animal habitats. 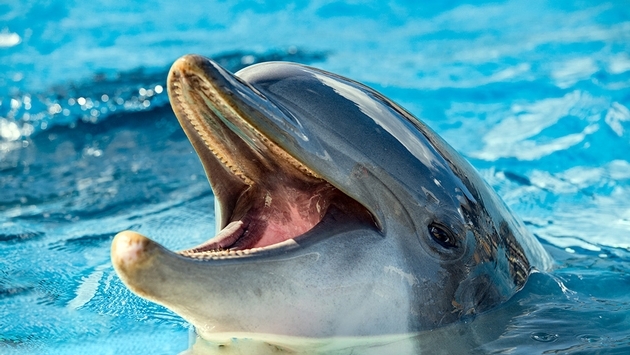 Dolphins born in captivity have a statistically higher rate of survivorship than those born in the wild, said Wise. The new baby dolphin will be named over the next four to six weeks.